The University of Edinburgh has won Talis Aspire’s Reading List challenge! Zombie Apocalypse Guide – How to access resources during a zombie outbreak or other event generated quite a buzz, with many other universities keen to use Charlie’s list as an example in their own institution. Charlie, now infamous for her marketing genius and zombie knowledge, created this list to provide information on accessing e-resources on and off-campus. She used the theme of a zombie apocalypse to brighten up what can be a fairly dull, and often confusing, subject for students. Many of the items on the list link to existing Library webpages or services, pointing students in the right direction for any help they might need. The resources (books, articles and webpages) used on the list are intriguing and fun and encourage you to explore the Library’s e-resources: Zombies and mathematical modelling, the epidemiology of a zombie apocalypse……who’d have thunk it?? Of course, there is a serious point to all this, and Charlie has included a lot of informative notes on the list which format well when exported to a PDF file, providing students with a useful and easy to follow guide to accessing e-resources. There is also guidance within the list to show how users (both academic and student) can make the most of Resource Lists features such as notes and read status. This Resource List is one of the Library Guides which you’ll find on ResourceLists@ Edinburgh (search for ‘ ‘library guides’) : http://resourcelists.ed.ac.uk . Angela Laurins, Library Learning Services Manager. 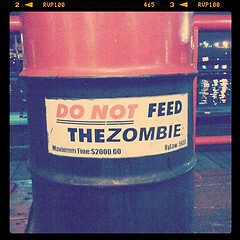 This entry was posted in Library, Online library resources and tagged Library Learning Services, promoting lists, Resource Lists @ Edinburgh, zombies on July 3, 2014 by alaurins.